A '47 Chevy in a cocktail at Playa. 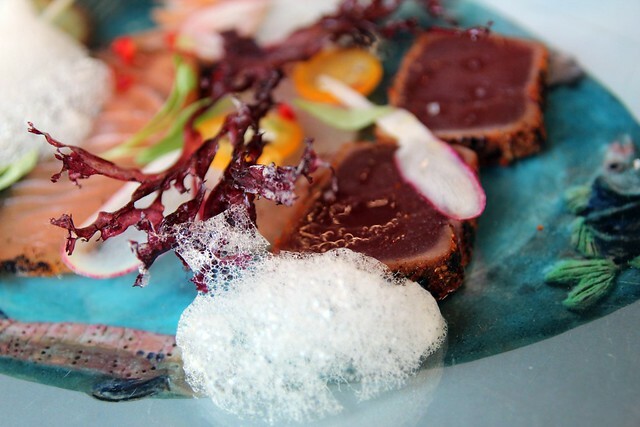 What does it taste like when art and cuisine come together? Now’s your chance to find out thanks to the collaborative efforts of chef John Sedlar, mixologist Julian Cox and artist Ron Cooper (also founder of Del Maguey Mezcal). The talented trio created a special super secret menu, “Art as an Appetizer,” to celebrate the Getty’s art initiative Pacific Standard Time. The dishes for this menu, which is only available from now through March 31st, can be had either as a $37 three-course dinner or a la carte (served only during dinner time at Rivera and Playa); the cocktails are $12 each. OK, the menu isn’t that much of a secret since you just have to ask for it at the two Sedlar restaurants or flash your PST museum ticket, but it still feels mighty special. Each dish, as is Sedlar’s MO, is plated on a piece of artwork. But this time instead of a glossy magazine spread, these delicacies showcase PST artwork so you can continue to peruse and contemplate art even as you dig into your beautifully plated meal. I had the chance to sample the menu at a private preview dinner at Playa along with other media types and Getty folk. The evening started off with Julian Cox’s mezcal cocktail interpretations of certain PST artwork. 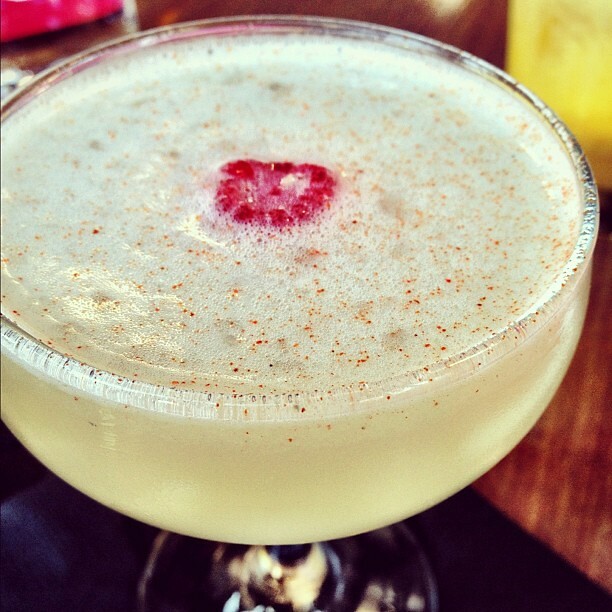 Ball Drop – Single Village mezcal, London dry gin, fresh lime, Velvet Falernum, yuzu tincture, cayenne. ?47 Chevy in Wilmington, CA – Micro climate mezcal, agave nectar, St. Vincent orgeat, passion fruit, fresh lemon, lavender air. For this drink, Julian took a hint from the deep-orange-ish Chevy in Oscar Castillo?s 1972 piece “’47 Chevy in Wilmington, CA” which is featured in the Icons of the Invisible: Oscar Castillo at the Fowler Museum, UCLA. The vibrant color of the car is echoed in the tiki style of the drink, and the white walls of the tires is called out in the lavender foam. Ball Drop: Julian did a variation on Playa’s Diving Bell cocktail, a mezcal daiquiri which involved dropping a brandied raspberry in the drink. Inspired by Ron Cooper?s 1969 piece “Ball Drop” featured at the Collection of the University Art Museum Art Video Archive at Cal State Long Beach University. 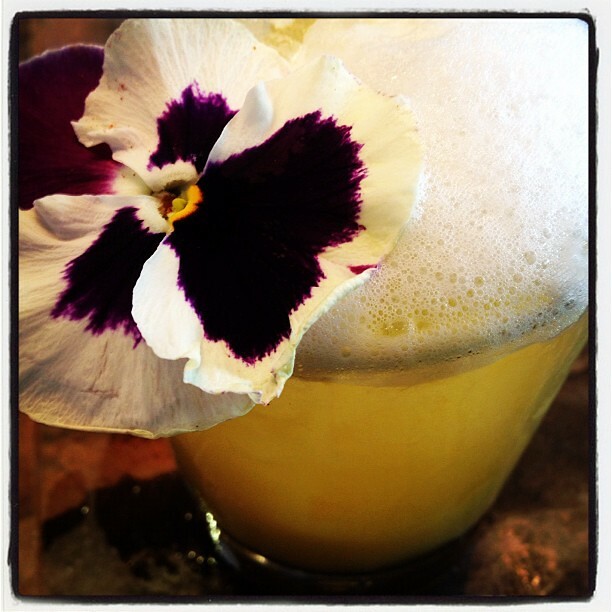 Untitled – Chichicapa, Cocchi Vermouth di Torino, Olorosso, grapefruit peel. The square box in Larry Bell?s piece “Untitled” screamed “Manhattan” to Julian, like the buildings in the city’s skyline so he made this Manhattan cocktail-like concoction. Needless to say it was my favorite of the trio and I couldn’t have just one. “Untitled” is featured in the Phenomenal: California Light, Space, Surface exhibition at the Museum of Contemporary Art, San Diego. Fish Platter: A crudo assortment of fresh and smoked seafood with kumquats, fresno chiles, lime, red seaweed, copita of chichicapa mezcal. The dish itself was very light. Enjoyed how well the fresh fish went with the feathery seaweed and froth. Inspired by Beatrice Wood?s “Fish Platter” featured in the Beatrice Wood: Career Woman-Drawings, Paintings, Vessels, and Objects exhibition at the Santa Monica Museum of Art. 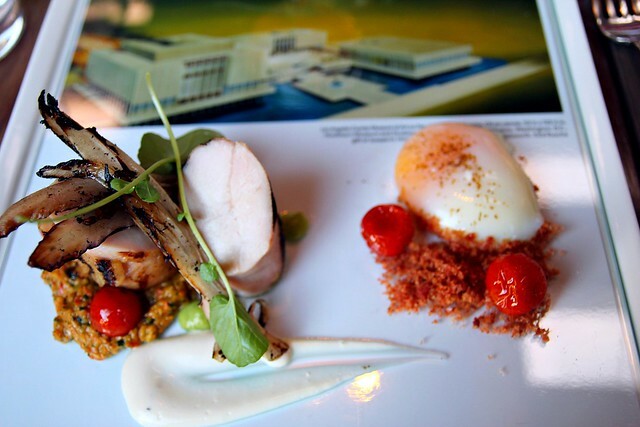 Los Angeles County Museum of Art on Fire: Grilled breast of chicken with Cobb salad quemado, goat cheese, incendiary salsa. This didn’t really set my mouth on fire even with the heads-up about the “incendiary salsa” but it was still delicious. Inspired by Ed Ruscha?s 1965-1968 “Los Angeles County Museum of Art on Fire” featured in the Crosscurrents in LA Painting and Sculpture 1950-1970 exhibition at The Getty Center. Inspired by Carlos Almaraz?s 1982 “Beach Trash Burning” in the Mapping Another LA: Chicano Art Movement exhibition at the Fowler Museum, UCLA. 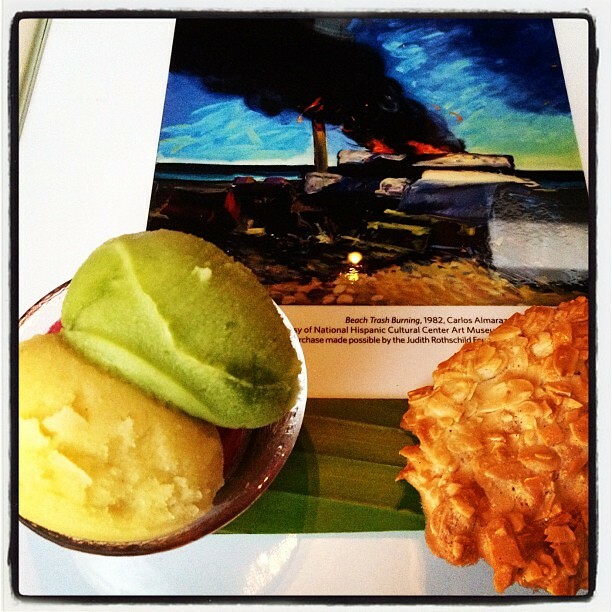 Beach Trash Burning: Sorbet splashes of roasted pineapple mescal, poblano chile lime, hibiscus pomegranate. My absolute favorite sorbet out of the trio was the Poblano Chile Lime with the spiciness of the chile working well with the astringent lime to create a refreshing sorbet. At $37 for three artsy bites, this obviously won’t satisfy the diner on a budget. But it is a perfect way to cap off an evening of taking in Pacific Standard Time art works. And the cocktails for sure are not to be missed. Mmm, Untitled never tasted so good! If you prefer food truck food, a selection of food trucks will congregate at meet-ups at various museums around town so you can dine immediately after checking out art.